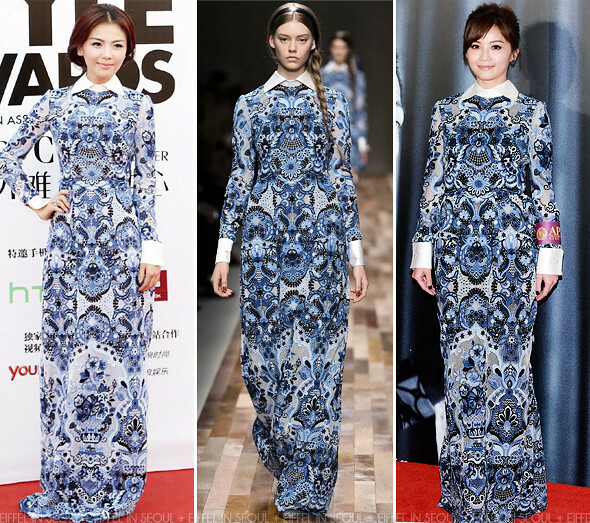 Chinese actress, Liu Tao (刘涛) was first seen wearing a guipure-lace gown from Valentino Fall/Winter 2013 collection at the 2013 Elle Style Awards held on November 2, 2013. Hong Kong actress, Charlene Choi (蔡卓妍) was seen wearing the same gown to the press conference of 'Streets of Macao (澳门街)' held during the 56th Asia Pacific Film Festival on December 14, 2013. It's a tough call between both of them since the only different is their hairstyle. I must say, both of them pulled off the outfit.